I learned how to make risotto about two years ago thanks to French Fridays with Dorie. It was good but it wasn’t easy. It was Stir. Stir. Stir. I have even made BAKED risotto. Eer since then when I find a new way to make risotto I feel obligated to try it. 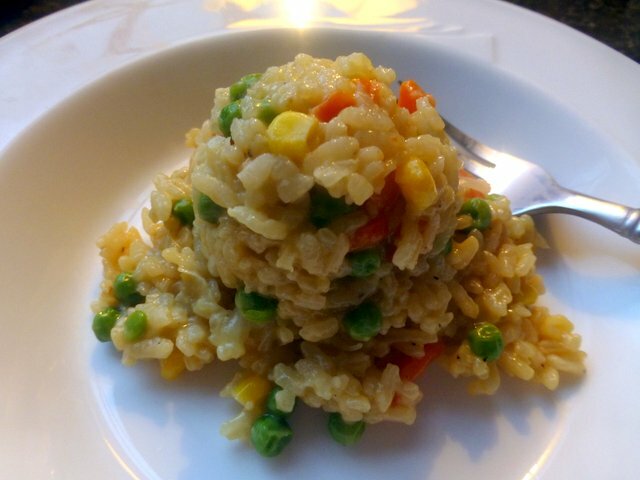 So when I found this recipe for microwave risotto….. You have to be kidding!! You HAVE to stir, stir, stir risotto. Microwave risotto?? Yes, indeed!! AND it turned out rather well. And creamy. Really! 1/3 cup plus 2 to 4 tablespoons water . 1. In I-quart microwave-safe dish, microwave butter on high (100 percent) 20 to 30 seconds or until melted. Stir in onion, cover with lid or vented plastic wrap, and microwave on high 1 minute. 2. Stir broth and rice into onion mixture; cover and microwave on high 6 minutes. (If microwave does not have carousel, rotate dish halfway through cooking.) Stir in carrot and red pepper; Cover and microwave on high 4 minutes. 3. Stir peas, 1/2 cup water, and the basil into rice mixture; cover and microwave on high 4 minutes; Stir, cover, and microwave on high 2 more minutes. 4. Stir in Parmesan, garlic, and black pepper; cover and set aside 6 to 8 minutes, stirring occasionally, until rice is cooked, but slightly chewy. If necessary, stir in 2 to 4 tablespoons water to give risotto a creamier consistency. Recipe is from “Country Living” magazine May 1995.